Spicy pepper vinegar is a must-have condiment for adding a kick to Southern cooked greens. Traditionally, bottles full of vinegar spiked with Tabasco peppers are found in soul food restaurants, which diners will shake onto everything from fried chicken to sauteed okra. You can use store-bought bottles, but putting together your own spicy vinegar means you can control the ingredients and control the heat. If you have trouble finding fresh Tabasco chiles, you can use a blend of chiles that you enjoy—from jalapenos to habaneros to cayenne. Just be careful while cutting them in half as the seeds and juice ​are very potent. If possible, use gloves and don’t touch your face without washing your hands first. Also be sure to clean the cutting board and knife very well after use. 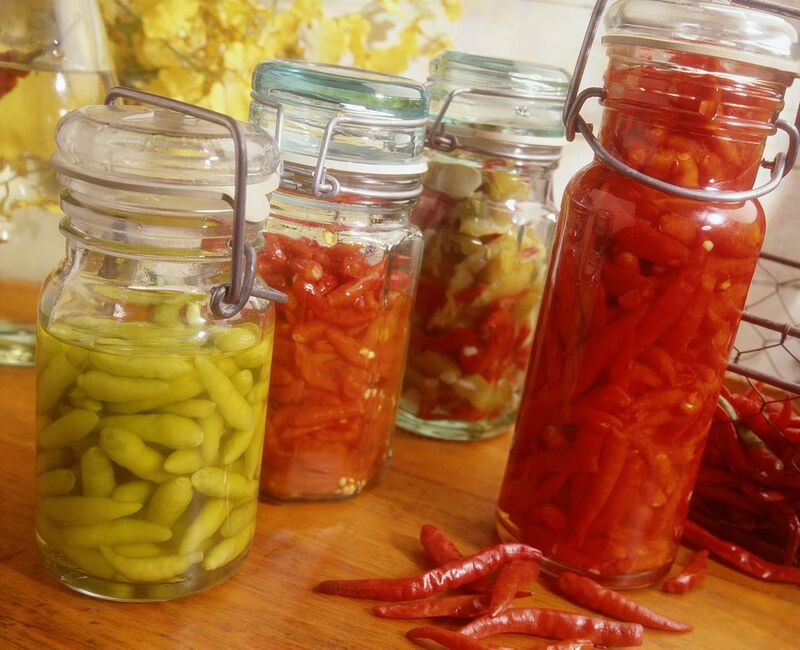 In a jar or glass container, add chile halves. In a small pot, add vinegar and bring to a boil over high heat. Once boiling, remove from heat. Using a funnel, carefully pour the vinegar over the chile halves in the glass container until all the chiles are covered. With so many varieties of peppers available, it can be confusing which are mouth-burning spicy and which just have a nice kick. A pepper's heat is rated by the Scoville scale which measures the units of heat in each type of chile. Bell peppers, for example, are a 0 on the Scoville scale while habanero is one of the spiciest, reaching between 100,000 and 350,000 spice units. If you are looking for something more in the middle, jalapeno, serrano, or cayenne (listed in ascending order) will provide heat without causing any tears. You can put a sprinkle of this hot vinegar on almost anything, but Southern dishes are the ideal base. Collard greens cooked with ham hocks, garlic, and a little sugar benefit from a bit of liquid spice, as does hoppin' John, a traditional dish of black-eyed peas, rice, and ham. Add a few drops to your fried chicken batter, or drizzle a bit on top of shrimp and grits.